Fall Into First: Teacher Week 2013 - Meet the Teacher! Teacher Week 2013 - Meet the Teacher! 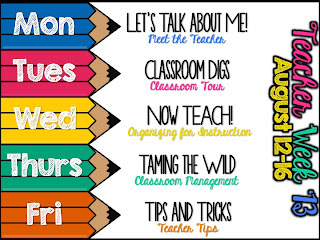 I am linking up with Blog Hoppin' to kick of Teacher Week 2013 with a linky party. Monday is the Let's Talk About Me Day, so here goes! 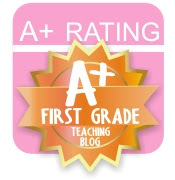 I am a teacher in sunny Arizona with a passion for making my first grade class a wonderful place to be. I have been teaching first grade for three years now and before that I taught kinder for 6 years. I love primary aged students, frankly the older kids scare me! 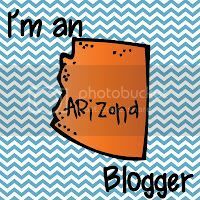 I grew up in AZ and went to ASU! I have my Masters in Educational Technology and I LOVE creating resources and lessons that involve technology because students are so motivated by it. Over the last several years, I have spent a lot of time creating math curriculum. When I moved to first grade I was told by the current first grade teachers that the most frustrating part of their day is math. They explained that our curriculum is out-dated, it did not align to standards, and we would be teaching without the workbook due to budget cuts. So...I set out creating daily math lesson plans. That is where my TpT/blogging life began in 2010. I have since sold to districts around the country and even teachers in Australia and Thailand have reached out to me about the success of my curriculum in their classroom. I feel so incredibly blessed to have worked with some many teachers and each time I receive more positive feedback I feel so grateful and excited to be making a difference outside of my classroom. I have created math curriculum for kinder and first grade and I am slowly (see below) working on creating curriculum for second grade. My life outside of school is amazing. I have a very supportive and loving husband and 2 beautiful little girls. My oldest daughter is 5, and my youngest is 9 months. Everyday I struggle with the work/life balance. Being a working mom is so incredibly difficult, and I have so much respect to all the moms out there who manage to pull it off while still maintaining their sanity. When I am working at home on school stuff I feel guilty for not doing mom stuff. It is a very tricky balancing act that I still have not yet perfected. I have finally come the the realization that I can't do everything (that was a tough one) and I have had to begin giving myself permission to relax and enjoy my family because they are the most important thing in the world to me and frankly as teachers we work WAY TOO HARD and no matter how hard you work, there is still more to be done!